A Court of Mist and Fury by Sarah J. Maas. Bloomsbury USA Childrens, 2016. Hardcover/Hardback. If there is one thing that Sarah J. Maas has absolutely never done, it's disappoint me. I unquestionably loved this book. I think this might end up being one of my favorite books of the year. 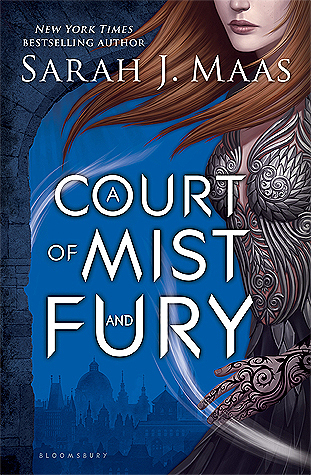 A Court of Mist and Fury (ACOMAF) is getting a lot of love and hype right now, and it so incredibly deserving of it. Everything about it is pure perfection. I immensely enjoyed A Court of Thorns and Roses (ACOTAR) when I read it last year, and to be honest I was quite skeptical and unsure if I wanted to risk being disappointed by a 'sophomore slump.' I'm now almost embarrassed for having doubted Maas - ACOMAF completely blows ACOTAR out of the water. The first area in which Maas excels is her creation of characters. She never fails to create the most realistic, well-rounded, and in-depth characters. She makes you fall in love with each person for their own unique personality, and not one character is inherently perfect with consistently perfect actions - everyone makes mistakes, some have been forced to make horrible, tragic decisions, and everyone eventually comes together into one large, realistic cast. Feyre's growth in particular was truly beautiful to watch unfold. Her continued memories and struggles from what occurred under the mountain were written in a harrowing and believable manner that I feel was crucial to her development. This is a problem that I feel likemany authors sometimes tend to overlook when writing after a momentous, life-changing event. Feyre truly grows from an already strong woman into an even stronger, self-sufficient woman than she already was. She is still the same person with the same values as before, but she is also completely different. I also loved the new characters Maas introduced into her world. Each one is integrated seamlessly and I immediately felt attached to each one. I also found myself completely immersed in the world-building of Maas. The lands are brilliant and I had so much fun exploring the various courts for the first time with Feyre. The idea of having the different courts - winter, autumn, night, summer, etc. - was extremely imaginative, and I thought the way Maas created each unique world's culture, fashion, and even weather was stunning. I loved the romance, and that's not something I say very often. It was not overdone or rushed in any way - it was just right. I could feel Feyre and Rhys' love slowly develop over time; I could feel Rhys' pain and Feyre's strong emotions as she discovered how much she was beginning to care for him. I know some people might be upset that Tamlin is now painted as a bad guy, and I understand that, I do, but frankly I don't think Maas is necessarily trying to paint him as some evil character. Instead, I really think its more that he just isn't a good fit for Feyre and he isn't necessarily sure who he is yet or what he should be doing. Tamlin has struggled a great deal throughout his life and has been placed in some fairly horrible situations. What he and Feyre went through under the mountain shaped them into completely different people than they were when they first met, and after what Tamlin witnessed, I understand his over-protection. However, that doesn't mean it justifies the way he treats her in any way at all, and I was also extremely angry and frustrated with his treatment of her, but it does allow me to understand why he seemed to suddenly change into an overprotective lughead - er, partner. This is where I would like to make a little shout out to Maas for writing Rhys to be not only such a naturally protective and caring man, but also an immensely encouraging man who never tries to hold Feyre back from anything. He knows what she is capable of and he allows her to act as she sees fit. He does not own her; they are equals. Creating characters, however, is not the only area in which Maas excels - she also does amazing things with plot, pacing, and writing. The pacing itself was excellent. Everything happened in a comfortable manner: emotional issues were dealt with in a realistic manner, progressions forward occurred at timely intervals, and nothing ever felt rushed or boring. She took time to expand on specific events when necessary and yet also knew when not to spend too much time on any one aspect that would eventually tire us out. Her writing is so intricate, but also incredibly fluid and readable - nothing seems forced or overdone. Overall, I think we all know what star rating ACOMAF is getting - do I really have to say it? Actually, yes, because it is getting five plus stars.